One of my research interests is in Victorian lunatic asylums and the treatment their patients received (and I’m editing a book, Insanity and the Lunatic Asylum in the Nineteenth Century which will be published in December 2014). 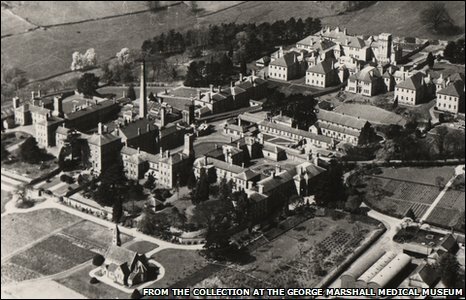 I’ve also been researching the origins of Barnsley Hall Asylum, in Bromsgrove, which was knocked down in 1996, so I was excited to discover that this year’s Elgar Society Lecture was on Edward Elgar and the Powick Lunatic Asylum in Worcester. In 1879 the young Elgar took up a post as bandmaster at the asylum, where he worked for 5 years. He was only 21 when he began, and among other work he composed a series of pieces for the asylum orchestra to perform. The Ken Russell film about Elgar (1962) is available in its entirety on Youtube, and ha s a sequence on Elgar’s time at Powick, including a performance of one of the asylum compositions. 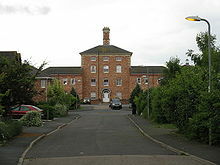 When Powick closed in 1988, the music was performed there one last time, as well as being recorded. In 2008 the score was published, and last year a new professional recording with members of the CBSO was produced; this was well-reviewed and reached number 8 in the classical charts (I own a copy and have very much enjoyed it). The lecture was given by Barry Collett, a conductor whose research led him to find Elgar’s Powick Asylum music, neglected in a corner in books labelled ‘Property of the Powick Hospital’, and to conduct its first performances in over a century; and Andew Lyle, who researched and eventually published the scores. Though both were clear that these aren’t ‘lost masterpieces’, the music is cheerful, ‘charming’, appropriate for the setting – but most of all, it demonstrates the composer at work, learning his craft – how to write, how to manage an orchestra, how to allow the instruments to perform to the highest level, and how to write music which was appropriate to a particular setting yet with a wider appeal. The lecture helpfully illuminated aspects of the music which appear in later, better known works by Elgar and demonstrate how valuable early compositions may be, just as the ‘juvenilia’ of writers is often a mine of gems which point to their later work. The asylum band was composed of staff, not inmates, and the range of instruments played by the staff is impressive. The Medical Superintendent of Powick, James Sherlock, was sympathetic to music as a form of therapy – very advanced for the time – so one wonders if he deliberately appointed musical staff! He bought instruments for the staff, whose skill was considerable judging by Elgar’s music written for them, and arranged musical instruction on two nights a week. His view was that ‘No other recreation has such a curative effect’. 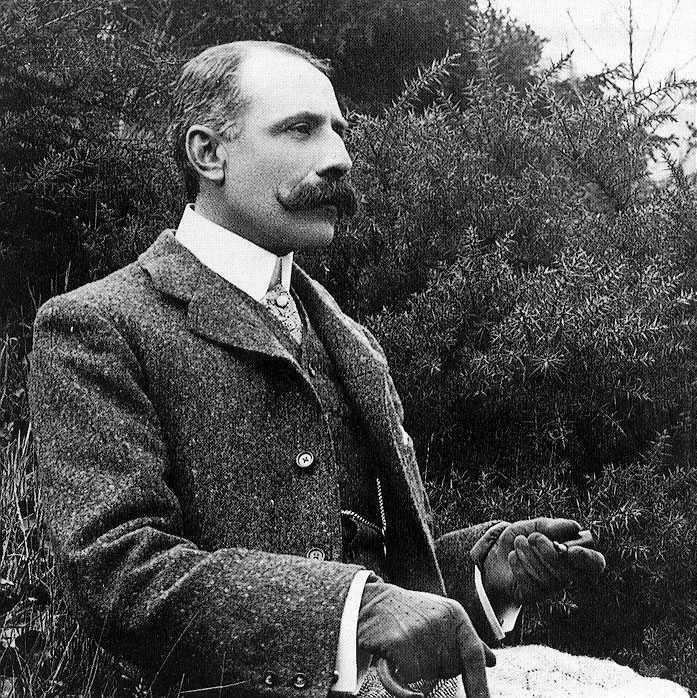 Elgar rehearsed the orchestra and conducted them for Friday afternoon dances for the patients to attend, as well as writing popular dances for them, such as the polka and the quadrille. Concerts were also held, again conducted by Elgar, and staff who contributed to the amusement of patients in these ways received a financial reward. No matter what the condition of the patients, the ability to enjoy and benefit from listening to music remained, an idea that is perhaps much more common today. Later in life, though, Elgar (who liked to shock people by referring to ‘when I was at the lunatic asylum’), said ‘I fear my music did little to alleviate the condition of the inmates’ – but when listening to the Powick Asylum music, I can’t help but think it must at least have provide a little cheer for them. Excellent post! You note that the asylum band was composed of staff who had a wide range of musical talents. So the Medical Superintendent of Powick was indeed a very modern thinker about therapy in a mental health setting. I had no idea that Elgar wrote for this group and conducted their performances, so now I am going to going back to my thinking about Elgar and revise a bit of my thinking. But why weren’t inmates allowed to actively participate. I am guessing, but if a fifth of all citizens back then could play a musical instrument, you might expect a fifth of all asylum residents to be capable of picking up an instrument as well. Would the Medical Superintendent have agreed that the inmates needed more therapy than the staff? Yes, I think it does make one think of Elgar a bit differently! I wondered about the patients, too – it seems a shame they couldn’t participate even if they did get to dance! At some point I’d like to do some more research on this to see if there were any patients who did get to play. I spent three months of my General Nurse training at Barnsley Hall Hospital and have friends who worked there for many years. There is also a Facebook page for Barnsley Hall. I am also trawling around for info and pictures as I love History,especially anything related to Medicine. Thank you for your comment – I’m interested to hear you worked at Barnsley Hall. I’ve been researching the early years of Barnsley Hall and will post some of it on the blog at some point. I’ve had a look at the Facebook page – there are some great photos on there.